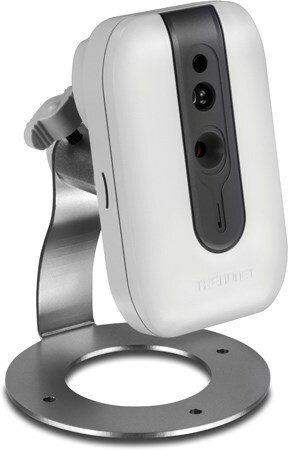 TRENDnet introduces the TV-IP762IC, a new wireless HD IP camera with night vision. The device will be available for $149. TRENDnet, a best-in-class wired and wireless networking hardware brand, from MedPi 2013, today announces the expansion of TRENDnet's popular cloud security camera line with the TV-IP762IC, Wireless HD Day / Night Cloud Camera. The TV-IP762IC installs on a wireless network in less than five minutes with a guided CD installation. Users then simply open a web browser and log onto the free secure TRENDnet Cloud service with their unique password to view and manage the TV-IP762IC from any internet connection. Free Apple and Android apps bring live video to smart phones and tablets. Each camera also comes with industry leading camera management software, to setup scheduled and motion detection recording for multiple cameras. "The TV-IP762IC offers an expanded viewing field and 720P HD image clarity," stated Zak Wood, director of global marketing. "Free apps and free pro-grade management software provide compelling value."